I visited the Cloisters in New York for the first time. The Cloisters is like a medieval castle on the top of a steep hill in the northern part of Manhattan overlooking the Hudson. The museum is filed with medieval artifacts. I have never thought deeply about medieval art or culture. I have not– until my visit to the Cloisters– appreciated the power of the period’s artwork. I have a Mary portrait on my wall that Beth Nardella made. It is a cyanotype-colored photograph of a Mary statuette in a cemetery. I have always loved the image. Artwork has come and gone in my home, but I always have Beth’s Mary hung somewhere. Mary has always been there, in a sense. 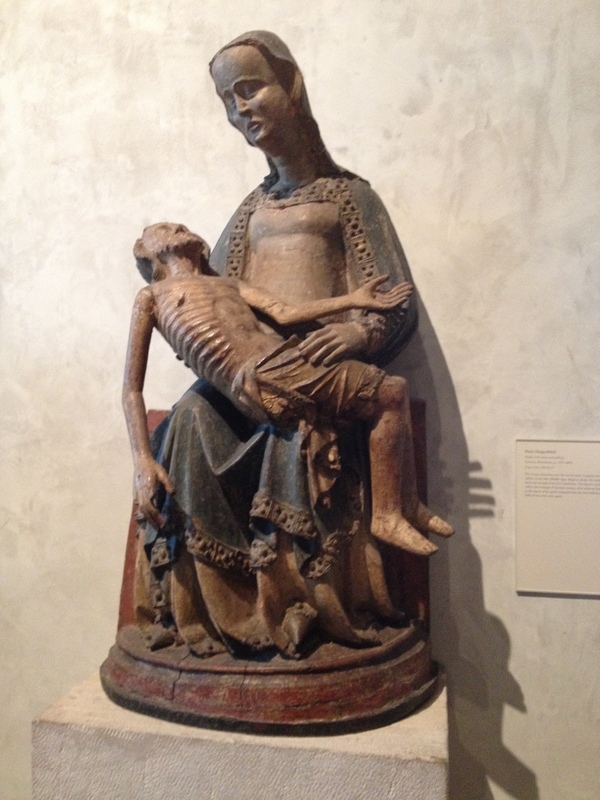 At the Cloisters, there are several Pietas that really affected me. One is roughly hewn from naked wood. Mary and Jesus are stiff and misshapen. The heads are too big. The proportions are all wrong. It reminds me of American folk art. In spite of the formal problems, the piece is powerful. Jesus’s body draped across Mary’s lap is smaller than it should be. I always read the text posted in a museum about the artwork– at a museum, I always need to read the guides posted by the artwork– and it explained (I paraphrase) that Jesus is deliberately smaller because as Mary held her son she remembered holding him as a child. It made perfect sense to me. When I think of Miles, I often think of him as a boy. Our walks. Our pizza shop and comic store visits. I think of him as the boy I guided and took care of, whom I protected and helped grow up. 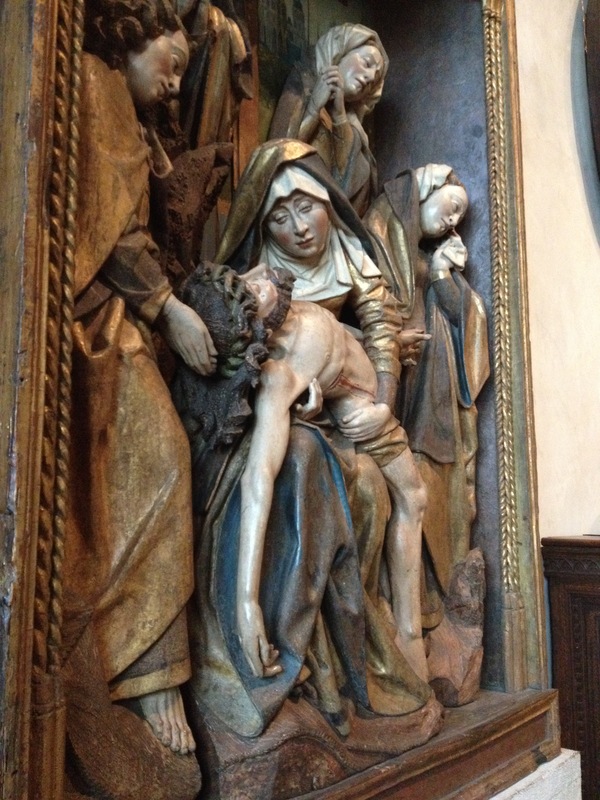 This primitive Pieta made total sense to me. There is another Pieta in the same room. It is so different. It is beautiful in its detail and realism. Mary’s despair and the emotion of those around her is so touching and palpably tragic. I could have studied it for hours. I took a picture of each of them and I look at them often. I fee like I understand Mary now. I did not read for a long time after Miles died. I read a lot, so it was unusual for me not to read at all. I did not even try. I did not have the will nor the desire. It meant nothing to me. The first book I read was Just Kids by Patti Smith. It is about her life as a young woman in New York trying to break into the music world as a performer and writer. She and the photographer Robert Mapplethorpe were close friends. They lived together and supported each other. They were part of the same scene, coming up together, struggling and eventually succeeding in their own ways. The book spoke to me– a young man learning to be a photographer, learning the craft and equipment and figuring out how to succeed in the art world. The people spoke to me. Patti Smith is a great writer and she made me appreciate youth and how to look back through the lens of experience to see yourself as what you were but did not believe yourself to be at the time, just a kid. It meant a lot to me. There are dozens of good Patti Smith songs I could choose, but I am choosing this gem of Patti Smith on a kids show singing “You Light Up My Life.” It really displays her talents as a powerful singer.